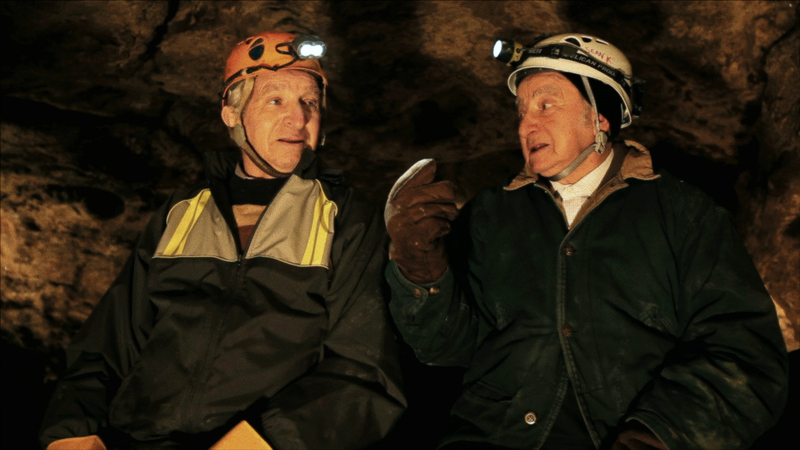 Sam Stermer and Saul Stermer inside Verteba Cave in NO PLACE ON EARTH, a Magnolia Pictures release. Photo courtesy of Magnolia Pictures. Janet Tobias' documentary No Place on Earth tells the story of the longest sustained underground survival in recorded history. It starts with Chris Nicola, a caver, who, while exploring caves in Ukraine, discovered artifacts that showed that people had lived there in the near past. This leads him to uncover the story of a group of Jews who escaped the Nazis during World War II by living in those caves for 511 days. The film is mostly through dramatic reenactments combined with interviews with Nicola and the Holocaust survivors who hid in the caves. This is an incredibly important documentary for people to view. Those that go to the movies know that there is no lack of Holocaust cinema. There are at least one or two Holocaust-themed films every year, most fascinating, some not. Many complain that they have heard it all and that they do not want to see yet another Holocaust film. No Place on Earth will make them think again. While the reenactments are interesting because they allow us to see the story unfold before our eyes, it is nothing extraordinary. They aren't daring and really do not have much that makes them stand out, but they don't need to. As a slight digression, I will discuss what makes a work of Holocaust cinema stand out on a technical aspect. Take Angieszka Holland's criminally under-seen Oscar-nominee In Darkness. A substantial portion of that film takes place in the sewers under Lvov. It is dark and dingy and Holland really plunges viewers into that world, making them feel claustrophobic and terrified. When a dramatic reenactment of the Holocaust has that kind of frighteningly realistic effect, it is a great piece of cinema on a technical level. When all artifice is gone, a piece of Holocaust cinema really shines. As mentioned, the reenactments in No Place on Earth do not need to be cinematic. They exist as a storytelling device to complement the interviews and help drive the story forward, not to exist purely by themselves. The story that they service is one of the more remarkable human triumphs of the past century. The odds that these people had to face were enormous, but because they were strong and resourceful, they survived. The interviewees in this film are very open to talk about their stories and experiences. While watching these people, these living parts of history, tell their stories we see them reliving their experiences in the caves all over again. Director Tobias keeps a fixed camera on them and just lets them talk. Tobias' voice is never heard, which was a good decision. The survivors and Nicola are the characters and Tobias not getting in their way allows the story to flow very well and the documentary to take on traditional narrative qualities. Overall, while straightforward almost to a fault, No Place on Earth is a powerful film about a little-known Holocaust story. It is uplifting and inspiring and will certainly please those who do not like traditional documentaries due to its extensive use of reenactments. No Place on Earth deserves to be seen as a reminder of the odds that people can overcome in the face of evil.